Drum Kits | Krash Boom Bam!!! The standard drum kit used for Rockabilly is typically as follows: Bass Drum also refered to as a kik drum is a staple from the Jazz age and beyond as is the snare drum, which can either have a shell of wood, metal, fiberglass or acrylic. The chinese toms evolved into rack toms and free standing floor toms. The standard current sizes of drum kits is a 20 or 22 inch bass drum with varying depths. 14 inch snare drums with a depth of either 5.5 or 6.5 is common althought the depths can either increase or decrease. Rack toms are usually 12, 13 or 14 inches with depths from 8 to 12 inches. 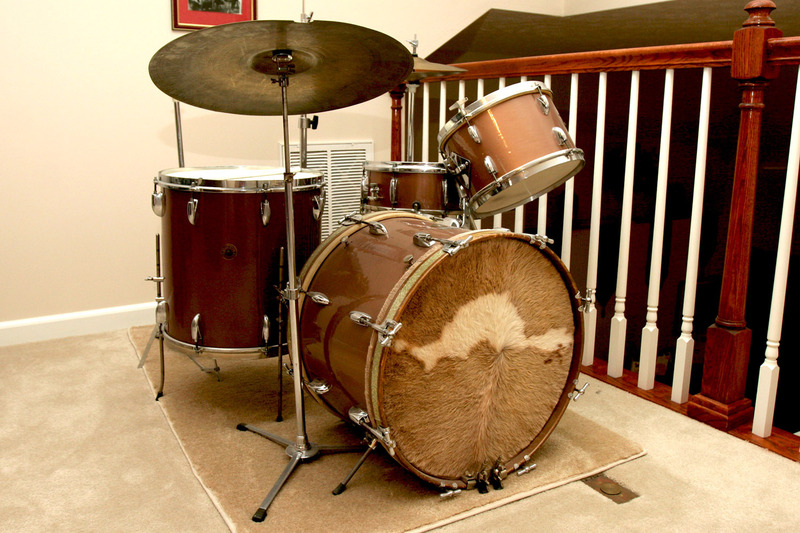 Floor toms are often found between 14, 16 and 18 inches with depths between 14 and 18 inches. The cymbals are often 14″ HiHats, 20″ Medium Ride, with 16 & 18″ Crashes usually Thins. 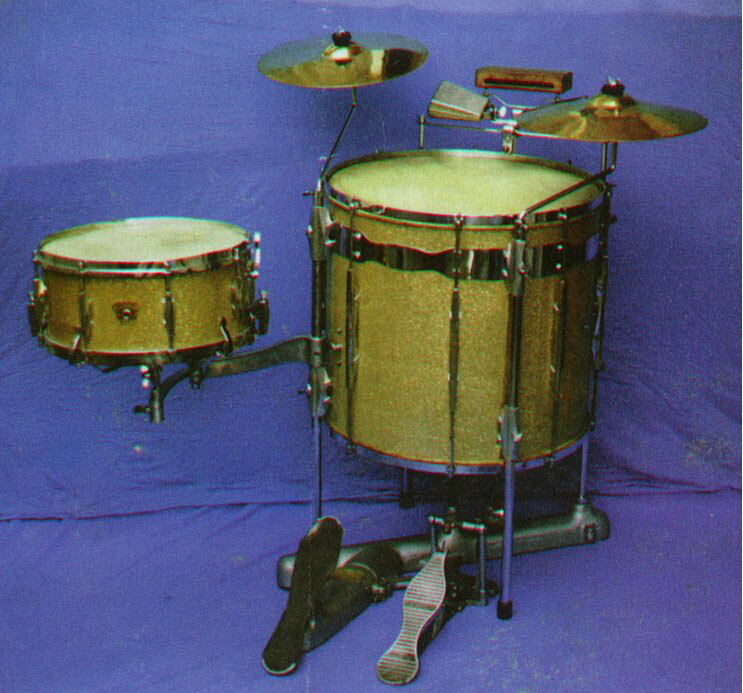 The Cocktail Drum Kit was introduced in 1948 The Carlton King Combination was a 20″ Floor Tom supported by a cast aluminum base with a footpedal that operated a timpani like tuning mechanism which was inside the Floor Tom giving the player the flexability to change the pitch of the drum on the fly. An arm folded out from a floor tom leg to support the snare drum basket. Also cymbal holders telescoped into the same legs with a rack to hold cowbells and woodblocks. The kit was introduced for use in the cramped orchestra pits of the day. Cocktail drums have changed in appearance since their introduction todays popular cocktail kit is usually a 14 – 16 x 24″ with 8″ snare drum and 10″ rack tom. The ‘Carlton Combo’ was never marketed as a ‘cocktail’ kit. It was designed to replace a standard drum set in bands that specialised in Latin music and ‘pit’ orchestras where it could to some extent replace tympani with its pedal tunable facility. It was not compact enough to be a cocktail set. It was very heavy to move about so it was not easily transportable. I played one of these monsters in a rumba band in 1950 and standing for 2 one hour sessions each night was backbreaking.